Lager, the beer that made St. Louis famous, is quickly making its return to my beer of summer. And being that this is my 50th summer on earth, I’m thrilled that Schlafly has decided to honor it as well as that other cool 1969 event, the Apollo 11 moon landing. 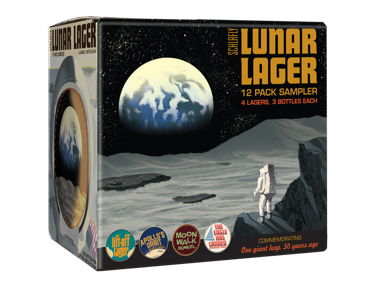 Lunar Lager, is a sampler pack of four exclusive lagers, brewed to commemorate the moon landing. From the font selection to the lager styles, the collection celebrates one of the most important accomplishments in American history. The four commemorative lagers include: Lift-Off Lager, Apollo’s Orbit Black Lager, Moon Walk Dunkel and The Eagle Has Landed American Lager. All will be available at your favorite brewpub this weekend, followed by a general release of the sampler pack in the coming weeks, leading up to the July anniversary of the moon landing. This unfiltered German lager calls back to the moments during one of the most exciting accomplishments in America. The light golden, hazy beer is an ode to the haze that filled the air that day. Although it’s as dark as the view outside Apollo’s window, this lager is smooth, crisp and drinkable. This dark, malty German lager pays tribute to the two brave men who strolled across the moon 50 years ago. The dark brown lager is balanced in both malty sweetness and hops. Light, golden and refreshing, this true American lager pays homage to the famous phrase that has been cemented as one of the most memorable sayings in our history. The Lunar Lager variety pack will be available for $13.99.